Is there a better alternative to PHP Studio? Is PHP Studio really the best app in Editors category? Will PHP Studio work good on macOS 10.13.4? PHP Studio is a powerful application for Mac OS X that gives you both substantial PHP editing tools and a great user experience. PHP Studio has all of the features you have come to expect from a code editor, such as syntax coloring, auto complete, and Regular Expression find and replace - but it also has some truly unique features that can't be found anywhere else. PHP Studio needs a rating. Be the first to rate this app and get the discussion started! Visualize Use PHP Studio's new Function Drawer to see a live-updated list of all of the functions in your PHP document. View the parameters and all of the variables associated with any function at a glance, then click one to jump to it instantly. Double click a variable, and it's inserted! The Function toolbar menu also allows you to quickly insert a local function. Edit Of course, there is more to PHP Studio than candy. PHP Studio delivers fully customizable syntax coloring - simply jump in the prefs and edit a color - no messy template editing required! Use the built-in autocomplete to instantly narrow down a list of 3,000+ PHP functions. Use the powerful Regular Expressions to find what you want, no matter how obscure it may be! 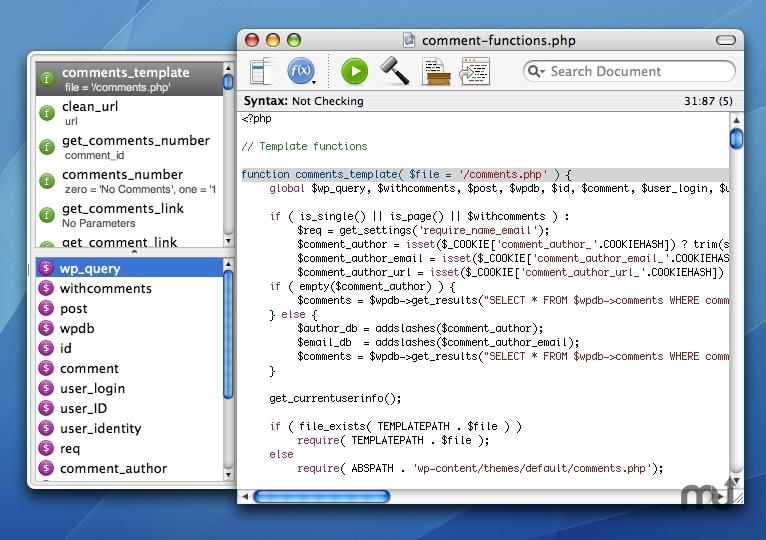 PHP Studio has, at its core, a powerful code editor. Test You can execute your PHP code right inside PHP studio - and view the results immediately. If there is an error, PHP Studio will jump you right to the problem line - complete with sound effects (that can be turned off, of course). And there is plenty more than just that! Integrated PHP help browsing, code cleaning, HTML export, and more.... - take PHP Studio for a spin and learn what a true Mac PHP editor can be.